Add a sleek look to your garden while supporting your favorite plant with the American GardenWorks Bronze Arch Trellis. 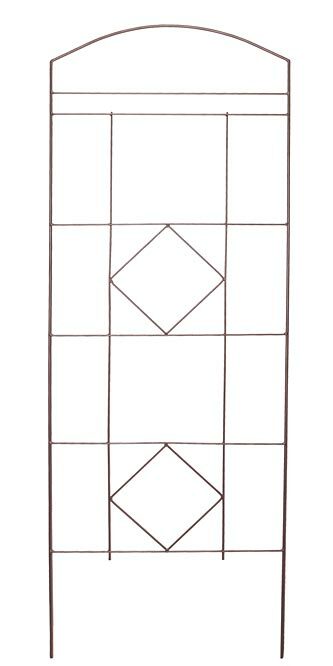 This dynamic trellis brings wonderful angles and geometry to your landscaping, for a fresh look within your flowers. Solid steel rods form the frame of this item, curving gently at the top for a delicate hint. Thinner vertical and horizontal steel rods intersect within the unit, creating a traditional grid which supports your plants. Two diamond shapes within this grid add more angles and visual interest to the piece, furthered by the bronze colored finish. The two, 11.5" long legs stake into your soil for quick installation, and the all steel body will look great in any setting. The powder coated finish helps the trellis withstand the elements, for a contemporary look for years to come. Bring bold style to your landscaping using this Bronze Arch Trellis. Made in the USA.